Nourished by the waters gushing out of the San Gabriel Mountains, Eaton Canyon explodes into delirious bloom – the wild mustard in shades of yellow and purple duking it out with penstemon and purple nightshade. With each bend of the trail – through the nature center area or up in the wilder parts, new vistas are revealed. Watch out for rattlesnakes and poison oak, though. This is wild country – and only partly tamed by trailbuilders. I started this plein air painting a few years ago and got distracted with other things and didn’t finish it up. Now that it’s almost springtime again, it seemed like a good time to revisit it and complete it. Since then, I’ve bought an artworks essentials EasyL which is much easier to transport, and doesn’t require a separate easelmate to hold things, like this Yarka did. I like the fact that I can raise the tripod with the Easy L so I’m not looking down at the painting. I’m tall and I always ended up with a backache at the end of the day from slightly bending over at the waist. A good friend of mine said that the Yarka is great for carrying pastels outdoors, however, so I might set it up with that. 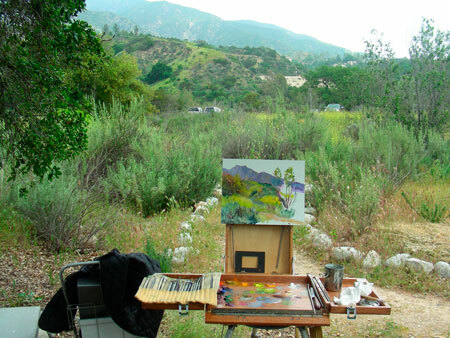 Almost every plein air painter I know has a collection of easels that they try, in search of the perfect one. The biggest advantage of this old Russian Yarka is that it’s light and sets up in about 1 minute. The down side is its height and lack of adaptability to carry wet panels of all sizes. 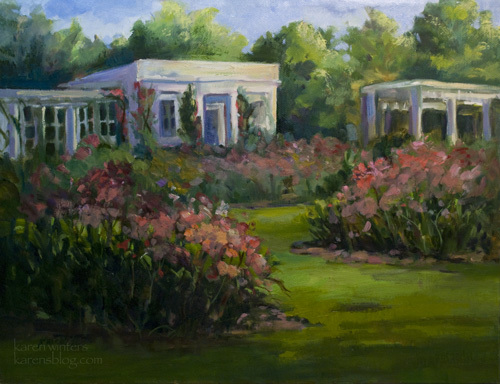 This plein air painting was done about a month ago and I thought I had posted it to my blog but just realized that I had not. So, here it is. 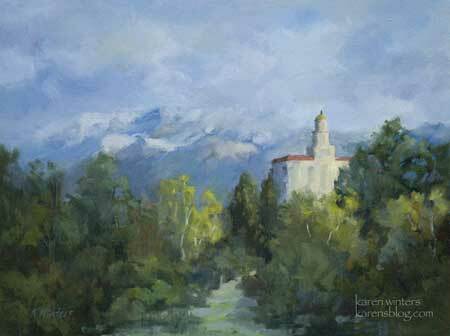 It was painted as part of a paint out for the California Art Club. The viewpoint is from the east side of the arroyo, near the Casita del Arroyo, looking westward. And speaking of the CAC, we had a fantastic time last night at the 100th anniversary celebration party of the California Art Club, held at the California Club in downtown LA. The champagne flowed freely and it was fun to see so many early California impressionist paintings decorating the walls of the club, as well as some paintings by some new California masters. It was a pleasure seeing so many old friends and making some new ones, too. No other organization does so much to preserve and promote the beauty of California as portrayed through traditional fine art, and I am always pleased to take part in their many activities. If you’re a traditional fine artist, you really should join. These are bittersweet times for us, with many mixed emotions. On one hand I’m blessed with so many new opportunities related to art, including my show at the Bowers Museum which will hang this Friday the 16th. On the other hand our almost 12 year old American bulldog Ripley has suddenly become seriously ill and we will probably need to say goodbye in a few days. Feeling intense joy and grief is part of life, and as the wise man said … “this too shall pass …” both the very good and the very sad. I pray for equanimity during these times, savoring good memories of the past and holding optimistic expectations for the future. The winter storms, which may now be over, often leave rare snowcaps on our local mountains – for a few days. I took advantage of one of these unusual scenes last month. This is a view I have painted before, in the autumn when the sycamores are in full color – and will likely paint again through the years with different weather and seasonal looks. Thanks to everyone who came out to the Casita del Arroyo show yesterday – it was a great day! 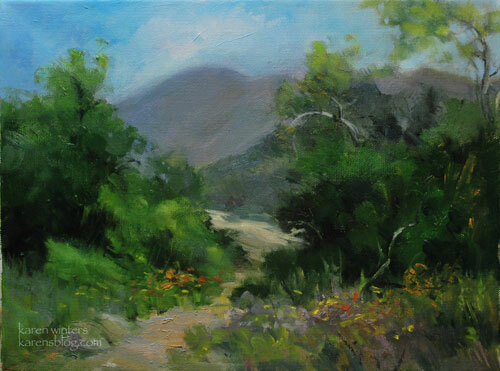 I’m now looking forward to spring painting in Central California and working on numerous commissioned projects. 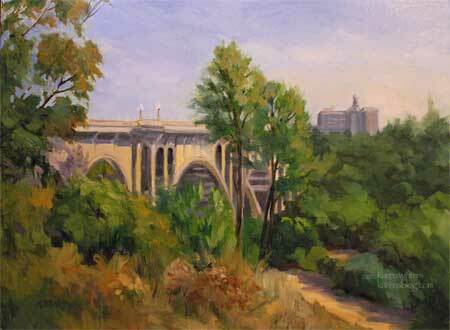 Interested in other Pasadena bridge paintings? 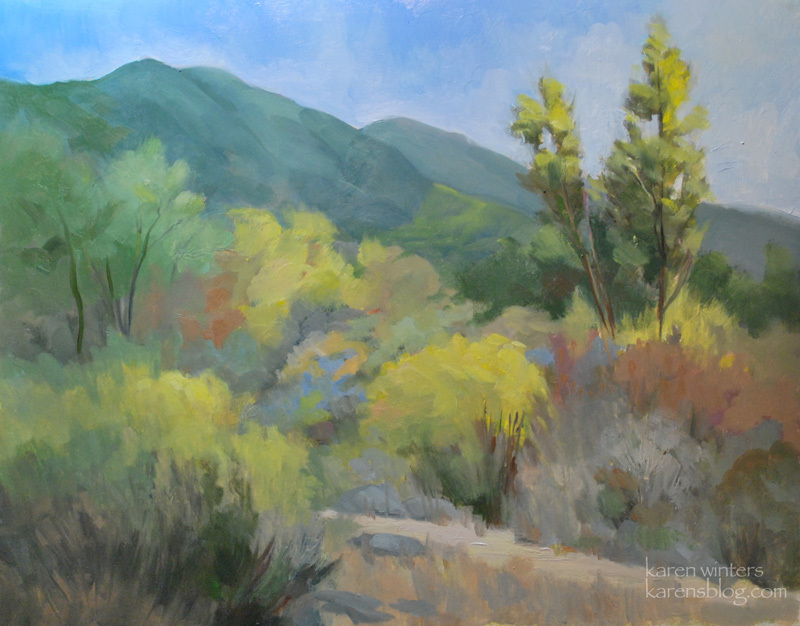 Last week I had the pleasure of painting this panorama of the Arroyo Seco from a vantage point high above the canyon. I wanted the late afternoon look, so I had to work fast. As it turned out, I left the painting of the sky and foreground for later, concentrating on the trees, grasses, mountains and architecture as the sun relentlessly continued its course. It’s an interesting time of year. Not all of the deciduous trees have leaves yet – but the grass is thick and abundant, and bright yellow green. In a few months the vivid green will turn straw brown and there will be a solid canopy of leafy trees below. Every season brings its own beauties to enjoy. 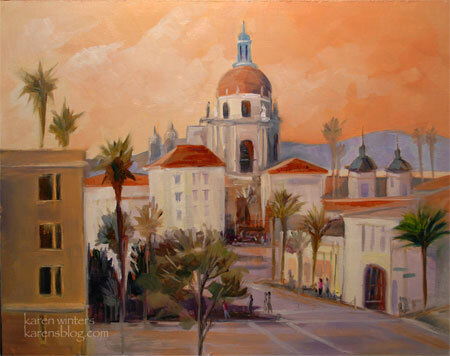 I’m guessing that I could look at a plein air painting of an early California impressionist and pretty well guess the month it was painted if I knew the location. This morning, after days of gray skies and pouring rain, we woke up to bright blue skies and snow in the San Gabriel Mountains above us. 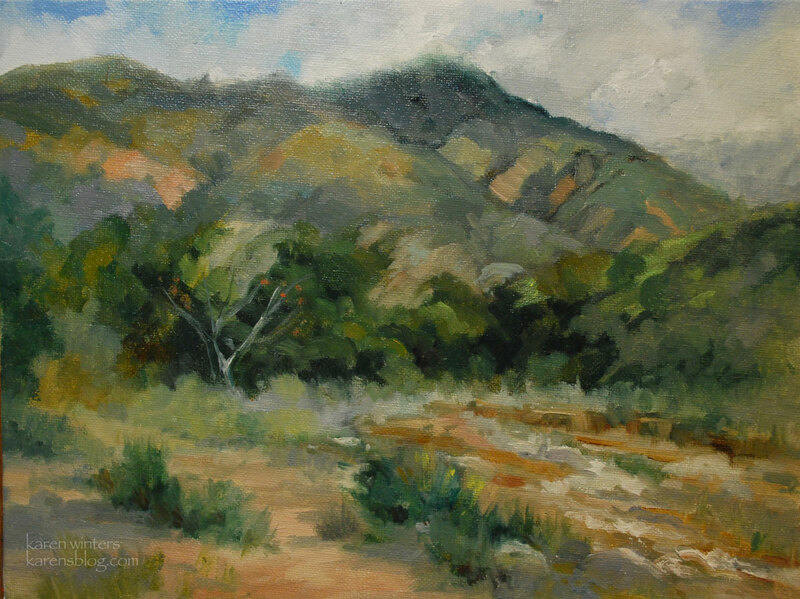 I knew the watershed of Eaton Canyon would be filled with flowing streams, and I was determined to go see for myself. 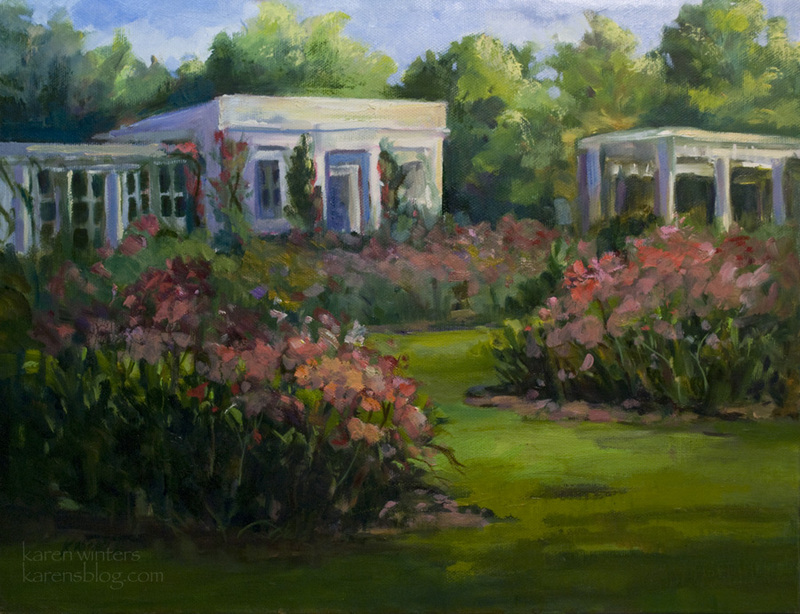 My original intention was just to get a few photos (my ankle is still healing and long standing is uncomfortable) but I knew I would kick myself if the scene looked highly paintable and I had left my plein air gear at home. So I packed the car and headed out, and was not disappointed. The mountains were a palette of soft blues, grays and violets and water was coursing among the big boulders. 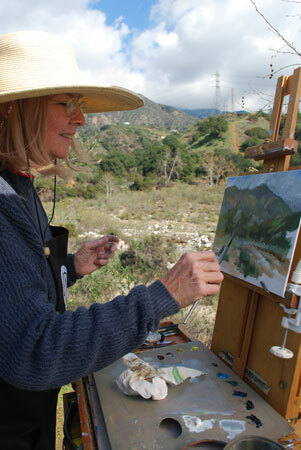 I resisted climbing down the bank – I don’t want to sprain myself again – but set up my easel along one of the trails. A photographer came by on a hike and kindly took a photo of me with my camera. (Thanks, Miguel!) He shot a batch himself with his Canon – I’m looking forward to seeing them. Days like this are just made for plein air painting. Although I was plenty weary toward the end of the afternoon painting (#2 painting for the day) I was in my element. I used a hand-held palette today instead of my usual glass one. I found it easier to match color when I could hold it up parallel to the plane of the canvas. 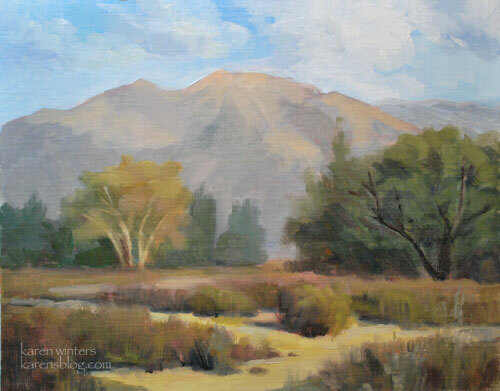 This is a painting I’ve been working on for awhile, and I thought it was time I finished it up while I continue progress with my fall Sierra series. 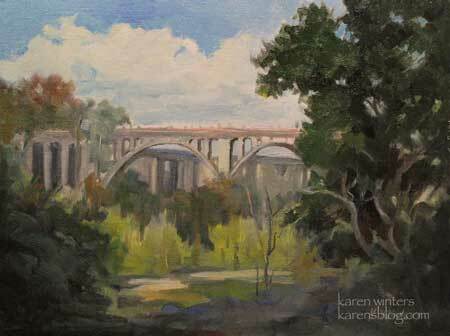 The Colorado Street Bridge (also known as the Suicide Bridge to locals) is a major Pasadena landmark, as is the Federal Courthouse, formerly the Vista Del Arroyo Hotel, which overlooks the arroyo. From a certain angle you can see both. The bridge is very tall, but surprisingly those pines are even taller. Along with painting, I’ve been in the throes of migrating to a new computer system. My old Mac was getting slow and a few USB and Firewire drives weren’t mounting, leading us to believe that there was a problem with those buses. Fortunately I had all my files backed up, but when two of my backup hard drives went down I knew it was time to make a change. Coincidence or causality? I don’t know if the old computer could hurt the drives but I wasn’t taking any chances. Leo LaPorte (the tech guy on the radio) is fond of saying that if you don’t have your files in at least two places, you don’t have them. Even when some of my drives were heading south, I immediately backed up the data onto a new one, plus DVDs as well. I’m thinking of subscribing to Carbonite for another layer of offsite protection. The good thing is that this new computer is much faster, which makes light work of editing photos of my paintings and organizing and cataloging my paintings. Anyway, upgrades are a tedious and time consuming process, so I’m hopeful that now I’ll be back in the swing of posting new paintings more regularly. But you gotta do what you gotta do, right?